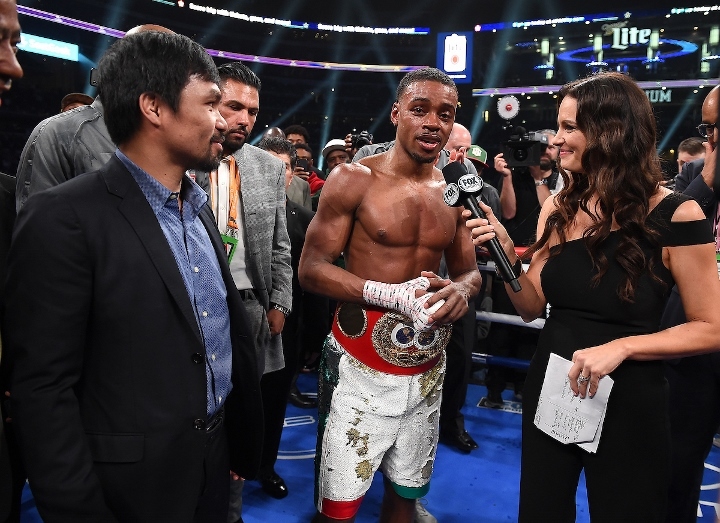 Former junior middleweight champion and current middleweight contender Jermall Charlo believes Manny Pacquiao will make for a much better contest with Errol Spence. On Saturday night at AT&T Stadium in Arlington, Texas - Spence dominated unbeaten four division champion Mikey Garcia over twelve rounds of action. Spence picked up a one-sided unanimous decision and retained his IBF welterweight title for a third time. Garcia, who holds the WBC world title at lightweight, was moving up by two weight divisions to take the fight. Prior to this bout, he'd never fought any higher than the junior welterweight limit. Pacquiao, the WBA "regular" champion at 147-pounds, was sitting ringside and entered the ring in the aftermath. Spence called him out for a future fight in July, which is when Pacquiao plans to fight again. Pacquiao accepted the challenge. Charlo, who shares the same head trainer, was very impressed by Spence's performance. "I seen a shutout performance by Errol. He delivered a statement. I want to see that Pacquiao-Spence fight come next. [Garcia] had no success, Errol did exactly what he needed to do, he shut him out, the game plan was phenomenal, everything was perfect. High respect for Garcia, he jumped in weight and made it happen, it was good," Charlo told BoxingScene.com. He believes nothing Garcia could have done would have turned the tide. "No [Garcia couldn't do anything], honestly the reach, the power, the skills. it was like God given. Honestly it was not a real good matchup. Styles makes fights and it was not a good fight for Mikey," Charlo said. But he's confident someone like Pacquiao, who's been fighting at 147-pounds since 2007, will put up a much better fight. "I think it would be a better fight than that was [with Garcia], I think because of size and things like that," Charlo said. I wouldn't recommend pac fight Errol or Crawford.those guys are in there prime they would embarrass him.he needs to fight people on a Thurman Porter and broner type level.